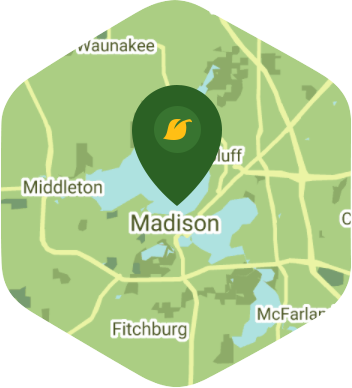 Book a skilled lawn pro in Madison. Backed by a total satisfaction guarantee and amazing customer support. Looking for the top rated Madison, WI lawn care services? Lawn Love is your lawn care service near me answer. If you're in need of Madison lawn services and have ever said I need lawn service near me at the push of a button then Lawn Love is your lawn care service answer. By bringing the lawn service industry into the 21st century, Lawn Love makes it easier than ever before to get lawn care to your door. Get an instant quote for lawn care services near Madison such as lawn aeration, lawn mowing, leaf removal, gutter cleaning, gardening, yard care, weed control and more. See why we're rated the #1 Madison lawn care service company. Madison is the capital of the Badger State for a reason – it has a lot to offer. Sure, there's the university, but you know that Madison has more than meets the eye. Whether you enjoy going down to the farmer's market on Wednesdays, checking out the latest art exhibitions, going on a hike, or trying one of the new downtown eateries, your social calendar can be packed full when you're not at work. So why spend precious free time toiling away in on your lawn when you can hire Lawn Love to do it for you? Lawn Love is a fully insured and bonded lawn care service. Our teams of experienced and skilled lawn care technicians want to help you create the lawn of your dreams. We can do a little or a lot – from the mowing and trimming to the weeding and seeding; Lawn Love is here to take care of all your lawn care needs. To find out more about Lawn Love's awesome services and to take advantage of our free, fast and easy two-minute quote, call us today at 608-888-0250! Rated 4.74 / 5 stars in 99,804 Lawn Love customer reviews. There won't be any rain in Madison today, which means you'll probably have to water your lawn. Dusk and dawn are the best times to water your lawn (the sun will rise at 6:26 AM and set at 7:43 PM today in Madison). Here are some average lawn care prices for homes in Madison. Average lawn size 8,521 sq. ft.